CAP is mindful that its operations must be performed within an environmental protection context. In this respect, one of its priorities has been to control and reduce its air emissions; an issue of significant importance in areas where air quality is indeed a motive of concern. The not-so-good air quality, worsened during certain times of the year, continues to be a national concern, particularly, in large metropolitan areas, in the vicinity of vast industrial and mining sites and in those cities where it is usual to burn wood. Although Chile has enacted air quality standards, the results have been only partially effective, according to the OECD environmental performance report. The main issue of concern is the MP2.5, measured since 2012, since the country is ranked in second place (after North Korea) among the OECD countries with the highest percentage of the population exposed to a high concentration of such particulate matter (greater than 35 μg/Nm3). This is mostly so because of the impact of the poor air quality of the Santiago Metropolitan Area. In order to confront this situation, the Environmental Ministry (MMA, in its Spanish acronym) developed a country-wide Atmospheric Decontamination Strategy for the 2014-2018 period. With respect to substances that damage the ozone layer, Chile had ratified the Vienna Convention and the Montreal Protocol in 1990, achieving the goals aimed at reducing the consumption of those substances that deplete the ozone (SAO, in its Spanish acronym). The most sensitive area is Huasco, an area that in the year 2011 was declared latent for breathable particulate matter by the MMA. In November 2016, the Council of Ministers for Sustainability approved the Air Pollution Prevention Plan for the Huasco locality and neighboring areas. This measure is framed within the MMA’s Atmospheric Decontamination Strategy for the 2014-2018 period. This plant is located in the Concepción Metropolitan Area; an area that in 2015 was declared saturated by the MMA. During the year 2016, the MMA made progress in the preparation of the prefeasibility project of the MP2.5 Decontamination Plan. In August of 2016, a PM10 Latency Statements and a MP2.5 Saturation Statement were issued, meant to launch a PM10 Preventive Plan and a MP2.5 Decontamination Plan. Cintac’s facilities operate principally in the Santiago Metropolitan Area, an area declared to be saturated by breathable particulate matter, which has an ongoing decontamination plan. Every CAP company has its own emission reduction measures. Examples of this are their emission suppression plans, their reforestation plans, and their nebulization systems, among others. 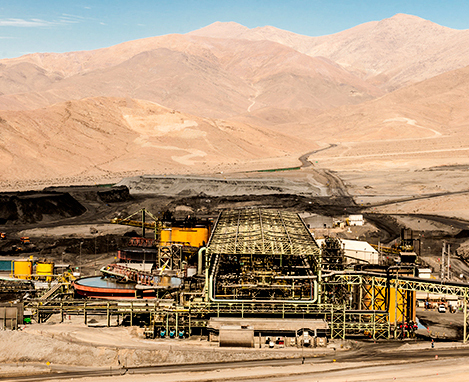 CAP Mineria’s pellet plant, located in the Huasco area, has a number of mitigation measures against particulate matter. Given that there is a Pollution Prevention Plan in place, any additional measures must be framed within such a plan. The mining operation emits 2,017 annual tons of PM10 in this area. 71% of all emissions correspond to fuels and 29% are associated to freight transport. The implementation of the referred plan is expected to reduce emissions by 70%. As regards the combustion activities of the pellet plant, an emission limit of 30 μg/Nm3 particulate matter was established for three chimneys of the thermal hardening process and a total annual limit of emissions for the entire facility of 341 tons. In terms of reducing emissions for combustion activities, the plan determines capping the top of each train wagon, implementing a system to wash train wagons, covering all inactive batteries lying around in collection areas, and implementing emission control techniques for transporting ore mineral via conveyor belts, among others. Puerto Las Losas, located in Huasco, has a procedure for handling emissions approved by the SEA, which provides the cleaning of its unloading system, wind barriers and a scheduled humidification of stockpiled batteries. At Cintac, the focus is on prevention. In 2016, a preventive maintenance was carried out of all emission sources and work was performed in designing an innovative and sustainable filter, denominated Live Filter. Its goal is to reduce emissions of particulate matter and thus avoid stoppage operations during critical air pollution periods (between April and September). The filter is made of vegetal plants and operates by passing emissions through a substrate of earth, which absorbs the emissions and, thanks to earth bacteria, transforms these emissions into plant nutrients (which are part of the filter). This project is in the stage of economic assessment and, if implemented, it would reduce emissions by 80%.